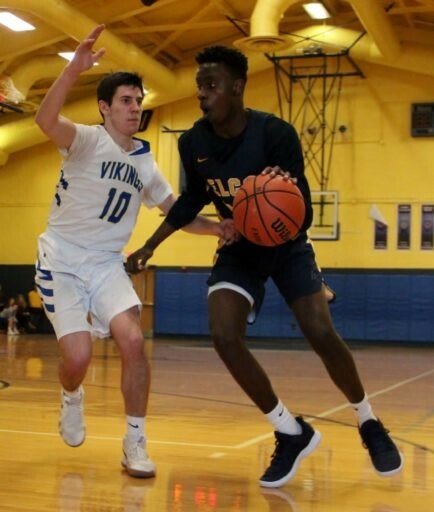 FREDERICKSBURG – The Elco boys’ basketball team isn’t all that concerned about how it does it. The Raiders simply want to get there. 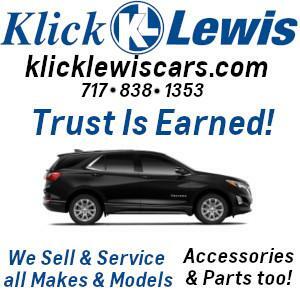 Right now, it’s more about the destination than the journey for Elco. 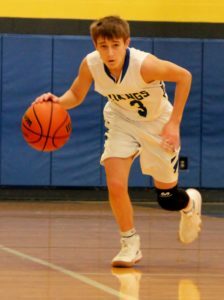 On Satruday afternoon, duringthe nightcap of a girls’-boys’ doubleheader, the Raiders took another important step towards the promised land that is the playoffs, with a 55-36 triumph over rival Northern Lebanon. 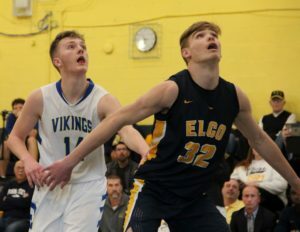 The Lancaster-Lebanon Section Four contest was closer than the final score might indicate – a couple of possessions most of the way – before Elco distanced itself from the Vikings in the fourth quarter. 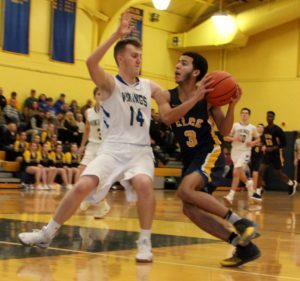 The result sewed up an L-L playoff berth for Elco, which improved to 12-8 on the season and 8-4 in Section Four. 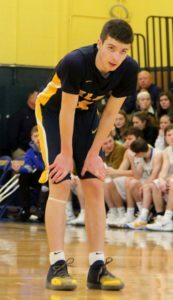 The Raiders are currently situated seventh in a District Three Class AAAA power rankings that accepts ten teams for its postseason tournament. 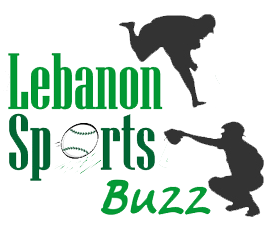 For Northern Lebanon, the loss was the tenth in its last 11 outings, after starting the season 4-4. 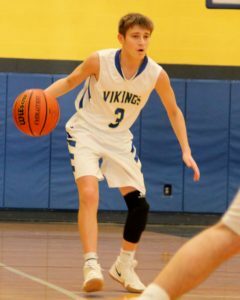 The Vikings, who had dropped a 40-31 decision to Elco in Myerstown on January 11th, are now 5-14 overall and 2-9 in the circuit. 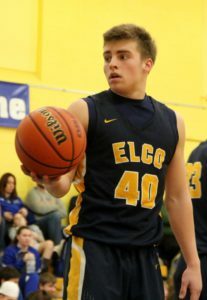 “The one road block between us and the L-Ls was this game,” said Elco head coach Brad Conners. 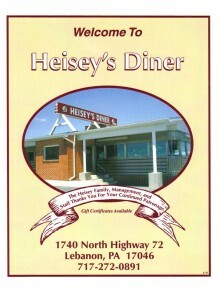 “This is a big one for us. I feel like the last five or six, everything has been on the line. 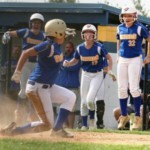 “I thought we played really well,” said Northern Lebanon head coach Chris George. 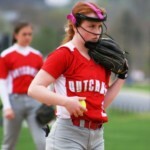 “Defensively, we played well most of the game. We were right there going into the fourth. It was two possessions most of the game. But we couldn’t hit a shot down the stretch. Courtesy of Viking Josh Bowers’ free throw at the end of the third stanza, Elco only led 37-31 heading into the fourth. 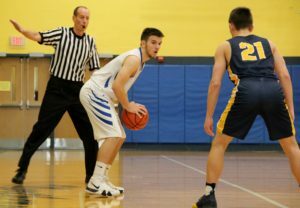 But the Raiders turned up their defensive intensity and hit Northern Lebanon with a crippling 18-4 run to start the final period. 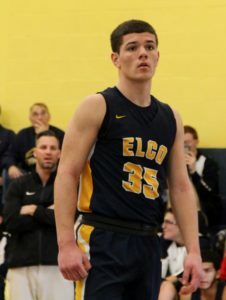 Behind eight points from Asher Kemble, four each by Evan Huey and Angel Martinez, and a Bryce Coletti deuce, Elco led 55-35 late in the fourth. “I’m very happy,” said Conners. “We walked out of here with a 19-point win. It’s a rival game. It’s always hard to close out a rival on the road. 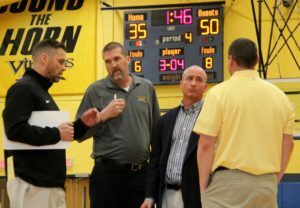 “If you told me going into the fourth quarter against Elco that we’d only hit a couple of shots and we’d be down just a few points, I’d take it,” said George. “We basically played the game we wanted to play. But sooner or later, you’ve got to hit shots. Just like the two before it, the third quarter was a struggle. An old-fashioned three-point play by Bowers 1:10 into the second half pulled the Vikings to within 26-24 of the Raiders. 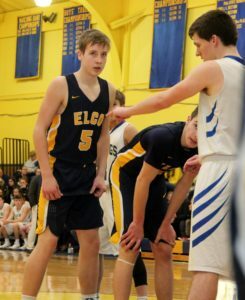 Elco’s response was a 9-1 spurt fueled by four Braden Bohannon points, a Kemble jumper, an inside basket from Luke Williams and a Coletti charity toss that jacked its lead back to 35-25. 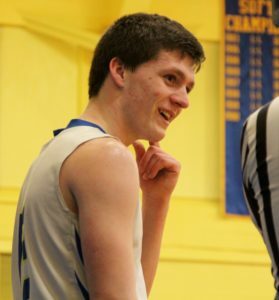 With 22 points, Kemble led all scorers, while Bohannon popped for 11 points. 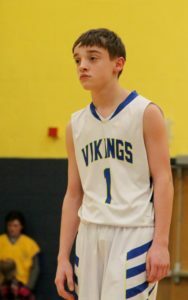 The Vikings got 11 points from Peyton Wolfe and ten from Bowers. 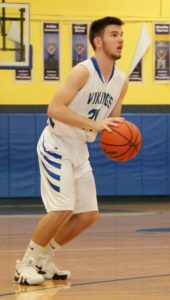 The Raiders held Northern Lebanon to six total field goals, but the Vikings attempted 31 foul shots, making 22 of them. 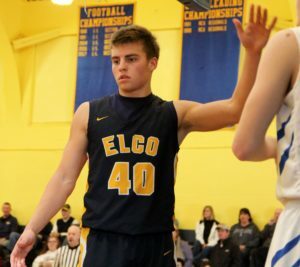 Elco notched 12 of the game’s first 15 points and led by nine points 4:21 in, on a driving lay-up from Coletti. 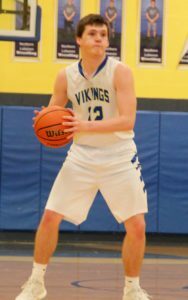 But Wolfe drained a three-pointer at the end of the opening quarter and Bowers worked his way inside for a deuce to open the second, and Northern Lebanon was within 19-14 of the lead. “The league is settled and I’m glad we’re in,” said Conners of the playoffs. 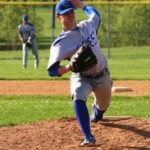 “After last night’s loss (Friday to Garden Spot), I couldn’t look at the district rankings. I’d like to see us get the sixth seed. 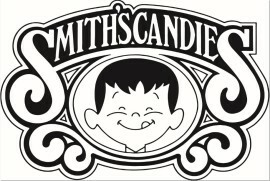 It guarantees you two games and it gives us a chance at states. We’ll see. They’re (his current group) a little ahead of other teams we’ve had. 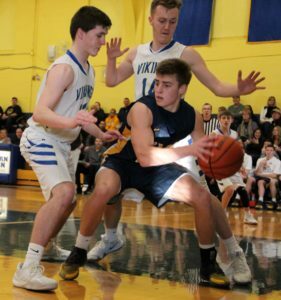 The Vikings netted four unanswered points in the middle of the second quarter to pull within 21-18 of Elco. The half ended with the Raiders ahead 26-21.